MEDIUM RESISTANCE STRETCH BAND SELECTED – 0.55mm thick. These medium exercise bands are designed for women. Also for men who have a lighter body build/frame. These medium resistance flat bands will be sufficient to take your fitness, strength and tone to a remarkably high level. 2 METRES – Doubles up to x2 tension. Tie the stretch band to make an exercise bands loop. Wraps around hands for a secure grip. Best bands for pilates, yoga, toning and home gym. EXERCISE CHART included showing best resistance band workouts. EXERCISE VIDEOS on the HardcoreMiniGym You Tube channel. SPRING 2017 15% DISCOUNT — Buy 2 (or more) resistance bands (any combination of tension eg 2 Heavy or 1 Heavy + 1 Light etc), and get 15% OFF EVERYTHING. Gift improved health and fitness to someone you care about. Attractive packaging means it’s a perfect present. This discount is automated for you at check-out. You will see the discounted amount. – Exercise resistance bands can be used all the time – in the office/TV/cooking/on holiday. Use for Beachbody, stretching, pregnancy, yoga, pilates, fitness and strength training, 90x, home fitness, seated exercising. – These resistance stretch bands are very strong and will not break. – 0.75mm thick. ~8kg force to double length of band – 16kg when doubled. Designed to be challenging for men and strong/athletic women. – 0.55mm thick. ~6kg force to double length of band – 12kg when doubled. Designed to be challenging for women and for men with a lighter build/frame. – 0.35mm thick. ~4kg force to double length of band – 8kg when doubled. Ideal for seniors, elderly, oaps, rehab and novice exercisers. 2m length means that chair structure can be used to aid exercises. – Additional exercises on the HardcoreMiniGym YouTube channel. Search on ‘hardcoreminigym.com’. – Easily double-up to double the exercise resistance. – Easily knotted to create an exercise loop. – Plenty of length to wrap around your hands for extra grip. – Good length to use chair structure for seated exercises. – The re-usable zip bag packaging is stylish and ideal for storage. – Makes a great gift. – Buy the wrong one and I’ll replace it. Not happy? I’ll refund your purchase. No risk, no problem. 1000’s HAPPY CUSTOMERS. SERVICE AS IT SHOULD BE. BUY WITH CONFIDENCE. 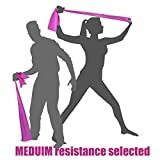 Posts related to MEDIUM TENSION BANDS (Mainly for Women and also for Men with a Lighter Frame/Build) - Exercise Resistance Stretch Bands - LATEX FREE - 2 METRES - The Ultimate Portable Multi Gym Sports Equipment for Home Fitness Strength Training - Exercises Legs, Arms, Bicep, Tricep, Shoulder, Stomach, and Abdominal Workout. A Great general Body Toner and Trainer - The Ideal Tension Rubber Band for Pilates Foam Mat Exercises, Rehab, Yoga, Beachbody, Abs, Insanity, Asylum, Roller and P90X Weights Workout - These Resistance Bands are the best piece of Fitness Equipment and Accessories for Home Workouts and Resistance Training.